Char the peeled medium onion and ginger on the stove top. Both gas and electric work fine for this step. Place the onion and ginger into a large pot and pour the broth and water on top. 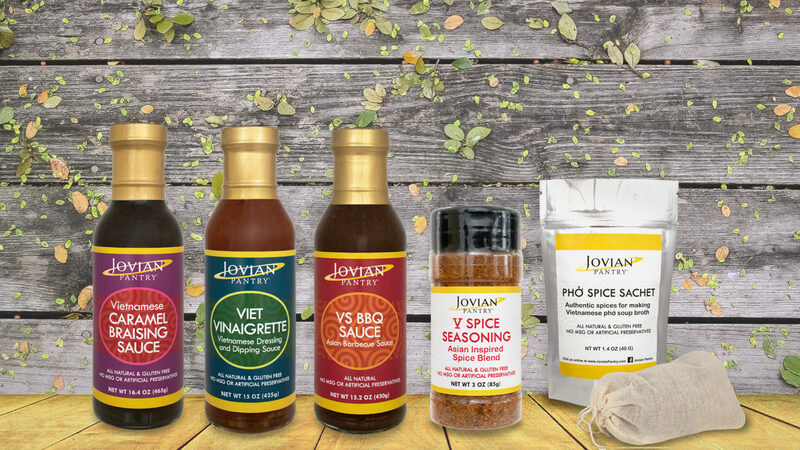 Add your Jovian Pantry® Phở Spice Sachet, bring the pot to a boil then add your protein* and simmer until it is cooked through. Unflavored seitan is a great alternative if you would like a vegetarian Phở. If you like an even more aromatic broth, simmer the sachet for an hour before adding your protein. While the broth is simmering, in a separate pot boil your Phở rice noodles according to the directions on the package. When they are done, strain and run under cold water to stop them from over-cooking. When the protein is done, remove it from the broth and skim the surface for detritus. You can add salt or fish sauce to taste to the broth and continue to simmer. Slice the protein to your desired thickness and reserve it for later. When you are ready to serve, in a bowl place a serving of cooked Phở noodles and layer your protein on top. Garnish with your sliced onions, cilantro, Thai basil, bean sprouts, and scallions. Carefully pour the hot broth into the bowl to cover. A squeeze of fresh lime juice gives a touch of acidity to brighten the broth, enhancing the flavor. The last step is to enjoy! Any leftover broth can be frozen so you can have Phở whenever you like. *If you are using flank steak you can instead add it raw and very thinly sliced to the noodles, then pour boiling broth over it for a nice tender beef. Place the steak in the freezer for 2 hours and it will be easier to slice.